When she was a young lawyer, Kholoud Al-Faqih walked into the office of Palestine's Chief Justice and announced she wanted to join the bench. He laughed at her. 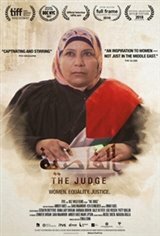 But just a few years later, Kholoud became the first woman judge to be appointed to the Middle East's Shari'a (Islamic law) courts.THE JUDGE offers a unique portrait of Judge Kholoud - her brave journey as a lawyer, her tireless fight for justice for women, and her drop-in visits with clients, friends, and family.